Whether renovating a basement to create an apartment, upgrading a bathroom or repainting an entire house, WORKS enjoys helping homeowners in Lynnfield, Massachusetts. 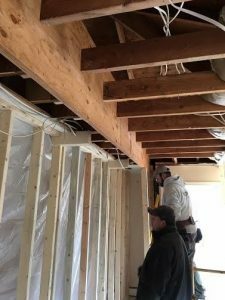 In the photo to the left, the WORKS team is working in early snow to bring in the wood beams that will transform the inside of a 50-year-old Lynnfield home. In the photo on the right, you can see one of those beams in place. Once we removed the temporary supporting wall (those uprights draped in plastic), the beam opened up the entire kitchen to a wall of windows with a heart-stopping view of Pillings Pond. 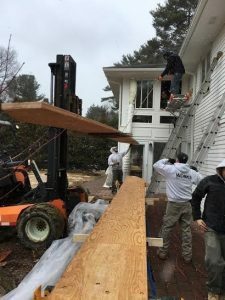 WORKS by Jesse DeBenedictis is proud to be the construction contractor of choice for so many homeowners on the North Shore of Boston. Fully licensed by the state of Massachusetts (# CS 91245 and HIC # 178604), WORKS has been working for over a decade with homeowners, architects, and interior designers throughout the North Shore, including Amesbury, Beverly, Boxford, Danvers, Essex, Georgetown, Gloucester, Groveland, Hamilton, Ipswich, Lynn, Rowley, Marblehead, Manchester-by-the-Sea, Middleton, Nahant, Newbury, Newburyport, Peabody, Rockport, Salem, Swampscott, Topsfield, Wenham, Middleton, and West Newbury. Settled in 1638, Lynnfield was always part of the transportation system between Boston and Portsmouth, New Hampshire: first by stagecoach and then by train and car. These days it is mostly a commuter town for Boston. Its residents include many sports figures, including Red Sox and Bruins players and coaches.